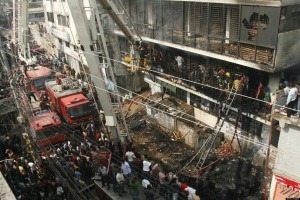 The Kader Toy Factory fire occurred on 10 May 1993 at a factory in Thailand. It is considered the worst industrial factory fire in history. 188 people were killed, and over 500 were seriously injured. More people were killed than in the Triangle Shirtwaist Factory fire; despite this, the incident received little media attention outside Thailand. The Kader toy factory manufactured stuffed toys and licensed plastic dolls primarily intended for export to the United States and other developed countries. The factory was poorly designed and built. Fire exits drawn in the building plans were not, in fact, constructed, and the existing external doors were locked. The building was reinforced with uninsulated steel girders which quickly weakened and collapsed when heated by the flames. At about 16:00 on 10 May 1993, a small fire was discovered on the first floor of part of the E-shaped building. Workers, located in the upper floors, were instructed to keep working wherein because they were told the fire was said to be minor. The fire alarm in this building did not sound. This part of the building was dedicated to the storage of finished products and the fire spread quickly. Other parts of the factory were full of raw materials which also burned very fast. Workers in the first building who tried to escape found the ground floor exit doors locked, and the stairwells soon collapsed. Many workers jumped from the second-, third-, and fourth-floor windows in order to escape the flames, resulting in severe injuries or death. Local security guards attempted unsuccessfully to put out the flames, and a call was made at 16:21 to the local Nakhon Pathom fire department. Firefighters arrived at the factory at about 16:40, to find Building One nearly ready to collapse. The fire spread extremely quickly because of the presence of the combustible plastics and fabrics, and reportedly it took less than an hour (only 53 minutes) for Building One to collapse from the time the local police called the fire brigade until 17:14. Fire alarms in Buildings Two and Three had sounded and all the workers from these buildings were able to escape, but the flames spread to these buildings as well. However, the fire brigades from Nakhon Pathom and neighboring Bangkok were able to put out these fires before these buildings were destroyed. What can we do to avoid industrial factory fires? Compartmentalization and sectioning against fire by partitions walls, fire-break false ceilings and smoke dispersal systems are very important in any construction way to avoid fires.